The vessel was built under the framework of a 2003 agreement on bilateral cooperation on dismantling Russia’s submarine fleet. The construction itself was agreed in July 2002 after the G8 summit in Kananaskis, Canada, where world leaders agreed to the Global Partnership against the Spread of Weapons and Materials of Mass Destruction. Under the Global Partnership, G-8 nations were to provide $20 million between 2002 and 2012 – $10 billion coming from the United States and another $10 from the group’s other members. In 2005, apparent shortfalls in money pledged and spent by member nations were discussed by the G-8 in Tokyo. Italy was among those that renewed its commitment to the Global Partnership, plugging €360 million ($560 million) into the agreement on top of other funding it had agreed to in 2003. The contract for the Rossita – which will go into service this year – was signed between deputy director of Russia’s state nuclear corporation Rosatom Yevgeny Yevstatov, and Giovanni Battista Narbone, head of the industrial policy management department of Italy’s Ministry of Economic Development in April of 2008. The Rossita was designed to be a universal container transport for spent nuclear fuel and radioactive waste of all types including the removable portion of nuclear reactors aboard Alpha Class Russian nuclear submarines. The vessel has two isolated cargo holds with a capacity of 720 tonnes. They are equipped with special ventilation systems to maintain appropriate temperatures. The vessel is 76 meters long with a 14-meter-wide cargo capacity of 1700 tonnes and a four meter draught. Its diesel engine power two propellers give the Rossita a speed of 12 knots. Judging by its forecasted transport routes, the Rossita’s tasks will be far from easy. One of its ports of call will be the retired naval base at Gremikha Bay, Andreyeva Bay, Sayda Bay, Murmansk, Severodvinsk and other coastal installations where spent nuclear fuel has been reprocessed, stored or unloaded. According to Rushka, the vessels two most tasks will be working with two specific installations. 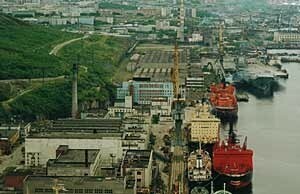 Prior to the beginning of the new year, a ship crew culled from Atomflot and the Murmansk Shipping Company’s most experienced sailors was sent to Italy. They first went through training on operating the Rossita, and then underwent preparations for sailing it to Murmansk. Plans to build new nuclear icebreakers have meanwhile been mothballed because Russia does not have the funding, despite a government decree that more would be built. Moreover, according to a government announcement, without the use of nuclear icebreakers, use of the northern sea route and Russia’s presence in general in areas of thick Arctic ice is impossible. “To my official inquiries to [Finance Minister Alexei] Kudrin, [Transport Minister Oleg [Levitin] and [Minister of Economic Development Elvira] Nabiullina, I received an answer that the commission [to build new icebreakers] exists but there is no money and that we are thinking of what to do,” said State Duma Deputy Igor Chernyshenko during a recent press conference in Murmansk.